UHealth Tower, a unit of University of Miami Hospital and Clinics, has received the American Heart Association/American Stroke Association’s Get With The Guidelines®-Stroke Gold Plus Quality Achievement Award. The award recognizes the hospital’s commitment to ensuring that stroke patients receive the most appropriate treatment according to nationally recognized, research-based guidelines based on the latest scientific evidence. 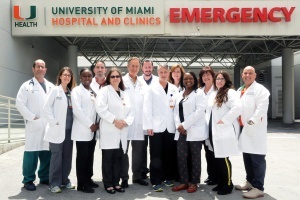 Members of the award-winning UHealth Tower Stroke Team, from left, David Lang, D.O., Christina Pacheco, Eldorana Pust, Aliercy Nunez Sanchez, Tara Michelle Cheung, RN, Sebastian Koch, M.D., Michael Greenberg, M.D., Shane Soorus, RN, Julianne Lee Burgos, Betty Hanley, Cathy Rosenberg, MSN, ARNP-BC, Amanda Demane, SLP, and Miguel Garcia. UHealth Tower earned the award by meeting specific quality achievement measures for the diagnosis and treatment of stroke patients at a set level for a designated period. These measures include evaluation of the proper use of medications and other stroke treatments aligned with the most up-to-date, evidence-based guidelines with the goal of speeding recovery and reducing death and disability for stroke patients. UHealth Tower additionally received the AHA/ASA Target: Stroke Elite Plus Award. To qualify for this recognition, hospitals must meet quality measures developed to reduce the time between the patient’s arrival at the hospital and treatment with the clot-buster tissue plasminogen activator, or tPA, the only drug approved by the U.S. Food and Drug Administration to treat ischemic stroke. Specifically, the hospital has achieved an average time to thrombolytic therapy within 60 minutes in 75 percent or more of acute ischemic stroke patients treated with IV tPA and door-to-needle time within 45 minutes in 50 percent of acute ischemic stroke patients treated with IV tPA.